Our ancient olive trees which are over 300 years old produce a finely balanced extra virgin olive oil. The olives are only suitable for olive oil production. 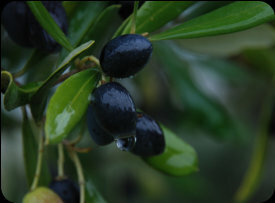 Our extra virgin olive oil is produced from a rare species of olive tree known as “Mignola”. It is particularly well suited to the climate, south facing aspect, soil type and altitude. These trees were introduced by the Greeks in the eight century BC and originally planted in the south of the peninsula. These ancient “Mignola” trees are typically found around Cingoli and its surrounding area. Our oil ranges in colour from green to golden, is light and fruity and pleasantly balanced, it is mainly sweet with hints of almonds and spices. Our oil is gaining recognition and as every top chef will tell you, the success to preparing a great meal is through using top quality ingredients. Michelin Star Chef Sean Hope was the first to assess and endorse our olive oil and his endorsement is shown below: “It is a fine balanced good quality extra virgin olive oil with a distinctive green/yellowy colour; it’s slightly sweet with a hint of almonds & spices. I use it as a condiment and also in salad dressings. It is reassuring to be able to source this single estate oil directly from Gregory & Sandra the English producers in Le Marche - Central Italy. We use it in our kitchen and bottles are for sale in our own shop”. Sean Hope has held his Michelin Star since 2002 and co-owns The Olive Branch & Beech House in Clipsham, Rutland and the Red Lion Inn in Stathern, Leicestershire - both are situated in the rich countryside of middle England. Our oil is produced directly from our 100 trees. Our oil is not blended with any one else’s oil or is any other oil added to it. 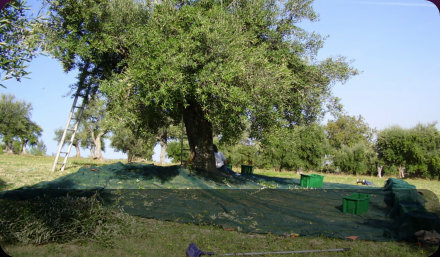 We hand pick our olives in November where the olives are raked gently to fall gently onto the nets below. 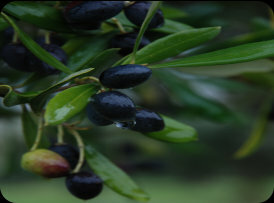 These are an optimum mixture of ripe black and green/yellow olives to produce our distinctive oil’s flavour and colour. After removal from the nets the olives are de- leafed, washed by hand and stored ready for pressing. Our oil has been tested by a panel of oil specialists to assess its organoleptic properties - flavour, bouquet and colour. Our farm is registered with the Marche Region. Our superior olive oil complies with all EU and Italian legislation with regard to quality, traceability, reporting, production, testing, labelling and packaging. We produce small quantities of this very special oil and export regularly to Australia, Europe, Sweden, Switzerland and the USA. We sell our oil in traditional 25cl glass bottles and 1 litre metal cans. We ship from 2 x 25cl glass bottles or 1 litre can upwards. Please e mail us for a quotation. 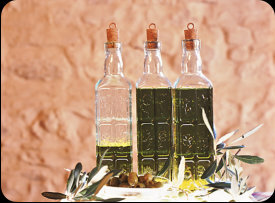 oliveoil@peritalia.com Oil is a magical ingredient and enhances all foods. It is best to use the oil as a condiment to appreciate its powerful aromas. It is an excellent dressing for cold and hot dishes. It’s delicious used in salad dressings and poured over fish or white meat before cooking. Pour over cooked vegetables such as asparagus, artichokes, fresh young peas or beans. The best way to savour our oil is to “drizzle” it onto crusty Italian bread or onto a slice of toast - absolutely delicious!